SINGAPORE - A residential site at Fourth Avenue under the reserve list of the first-half 2017 Government Land Sales (GLS) programme was launched for sale by public tender on Thursday (Nov 2), the Urban Redevelopment Authority (URA) announced. The tender for the land parcel will close at noon on Dec 5, with a minimum bid price of S$448.8 million. As standard practice, the URA does not reveal the identity of the applicant who triggered the land sale. Nestled in a mature private residential estate in Bukit Timah, the site can build an estimated 455 housing units and has a land area of about 1.9 hectares with a maximum permissible gross floor area of 33,358 square metres. 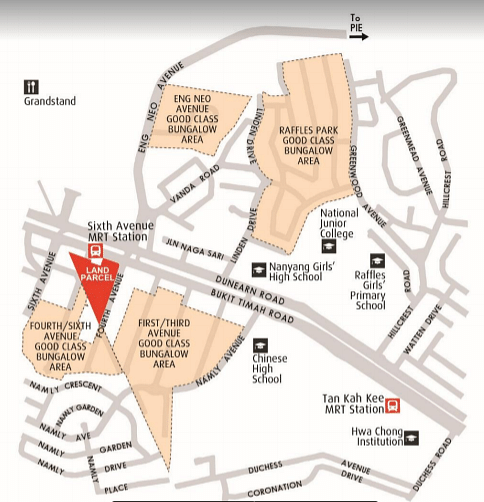 The leasehold plot is situated next to the Sixth Avenue MRT Station and near popular schools such as Nanyang Girls' High School, National Junior College, Hwa Chong Institution and Raffles Girls' Primary School. The tender closes the same day as that for the former Zouk site at Jiak Kim Street.